GARDENA, Calif. – October 11, 2016 – Carroll Shelby’s Store is teaming up with the National Breast Cancer Foundation, Inc. in the race against breast cancer. During October 2016, Carroll Shelby’s Store will donate $5 to the Foundation for each exclusive breast cancer awareness t-shirt and hat purchased through it; the funds will be used for prevention and research programs. Breast cancer is among the leading health crises for women in the United States; 1 in 8 individuals will be diagnosed in their lifetime. National Breast Cancer Foundation, Inc. was founded in 1991 by breast cancer survivor, Janelle Hail. With so little information available about the disease at the time of her diagnosis, she was forced to make health decisions with few options. After her treatment, Janelle committed to educating women worldwide about breast cancer and the importance of early detection. Today, NBCF provides resources including free mammograms, inspiration and support to those affected by this deadly disease. During October, Shelby fans are encouraged to join in the support during Breast Cancer Awareness Month. 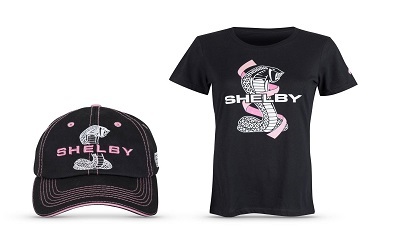 For every exclusive Shelby breast cancer awareness t-shirt or hat purchased, Carroll Shelby’s Store will donate $5 to the Foundation. If purchased together, $10 will go to the charity. The special hat and t-shirt are only available through www.shelbystore.com or inside Carroll Shelby’s Store at Shelby American in Las Vegas. Recognized as one of the leading breast cancer organizations in the world, National Breast Cancer Foundation, Inc. (NBCF) is Helping Women Now® by providing early detection, education and support services to those affected by breast cancer. A recipient of Charity Navigator’s highest 4-star rating for twelve years, NBCF provides support through their National Mammography Program, Patient Navigation, Beyond The Shock®, breast health education, and research programs. For more information, please visit www.nbcf.org.